News of brand new music from Jay Rock just keeps on coming. 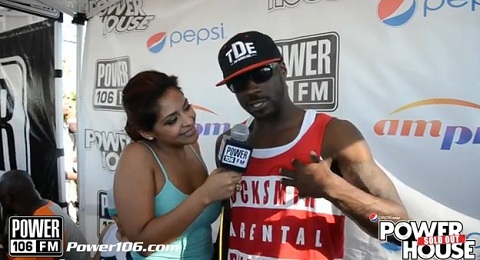 The TDE/Strange Music emcee recently caught up with Power 106 backstage during their PowerHouse summer concert for an exclusive video interview. Thanking the radio station for supporting his music and label from the start, Jay Rock also went on to give a brief update on his music. The Watts native assures fans that he’s been working on new music as well as the rest of the Top Dawg Ent. camp. Following Strange Music CEO Travis O’Guin’s comments on the next Jay Rock album, it looks like fans won’t have to wait much longer for some West Coast flavor. Are you eager for more from Jay Rock? Have you kept up with his guest appearances on TDE albums?